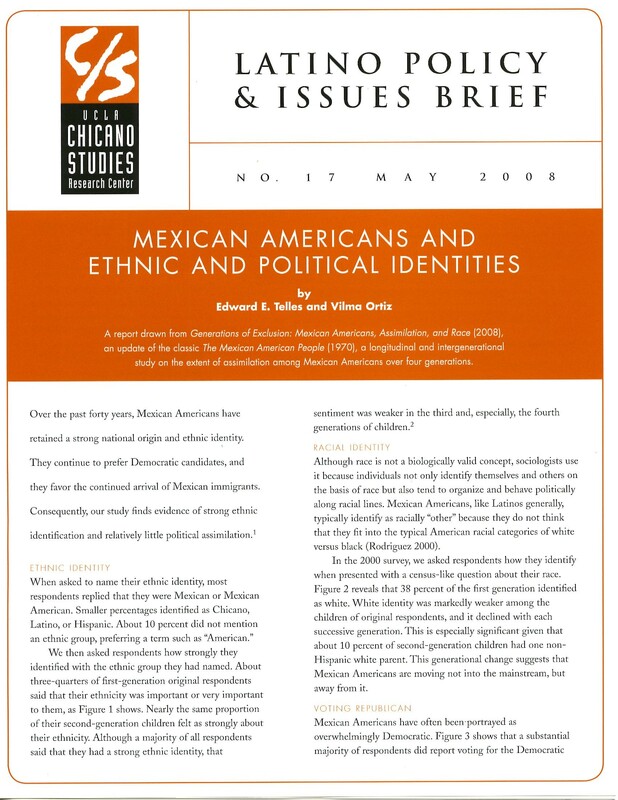 This brief offers evidence that Mexican Americans continue to identify with their ethnic culture and that ethnic identification remains strong across generations. In addition, they are part of a community with a distinct political sensibility. Their incorporation into mainstream U.S. culture has been slow in regard to ethnic and political identies. Latino Policy & Issues Briefs numbers 17-21 were generated by the Mexican American Study Project (MASP), a research project based at UCLA. In 1965–66, MASP project teams interviewed Mexican Americans living in Los Angeles and San Antonio; in 1997–2000, Professors Edward E. Telles and Vilma Ortiz re-interviewed the original participants, plus two of their adult children. The two surveys provide data for a systematic analysis of how well Mexican Americans are being absorbed into the predominant culture.